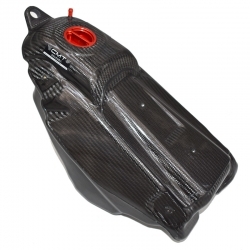 Carbon rear disk guard made of prepreg aeronautical carbon for the Honda CR 250 2002 - 2003 - 2004 - 2005 - 2006 - 2007 models that is designed to protect from any impact, collision with branches and/or stones and, also, rubbings caused by the contact of boots with the vehicle. The attention to detail and the unequivocal quality of the product are guaranteed by the machining process (specifically autoclave polymerization), which our industry experts guarantee every day. No use of transparent paints used during the producing.